– Franklin posted its highest score of the season to beat Norton in a battle of young programs. The Panthers, in their second year, had junior Mia Lizotte win the All Around with a 36.55 while freshman Lexi Lupien placed with a 32.05. Vault – Mia Lizotte 9.25; Rachel Cyr 8.75; Lexi Lupien 8.7; Audrey DiMella 8.65. Bars – Lizotte 8.85; Liz Traphagen 8.7; Sadie Rondeau 8.5; Lupien 7.4. Beam – Lizotte 8.8; Rondeau 8.8; Traphagen 8.4; Molly Stanton 7.9; Lupien 7.2. Floor – Lizotte 9.65; Traphagen 9.4; Rondeau 9.15; Lupien 8.75. 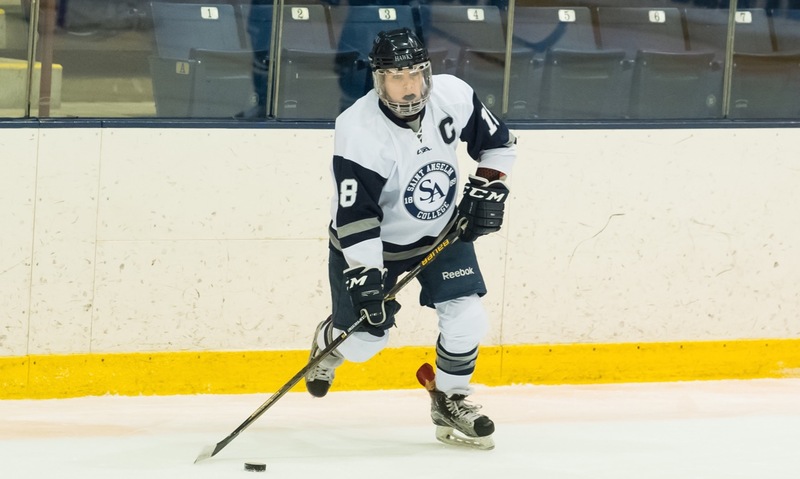 "St. Anselm College women’s hockey is on a roll at the start of the new season, racking up 14 wins in the opening 17 games including a win against Franklin Pierce on Friday, and one of the leaders for the Hawks again this winter is senior forward Kaitlyn Spillane. The former Franklin standout is closing in on the 100-point milestone for her career (she has 88 as of Saturday morning) and is currently third on the team in goals with seven, second on the team with 11 assists, and second with 18 points.